Voters in four states easily approved ballot initiatives to raise their minimum wages on Tuesday, further evidence of strong public support for the idea that the current federal minimum of $7.25 an hour isn’t enough for today’s workers. The votes in Alaska, Arkansas, Nebraska and South Dakota mean that by Jan. 1, 29 of the 50 states (plus the District of Columbia) will have higher minimums than the federal standard. President Obama and many Democrats have pushed for raising the federal minimum wage to $10.10 an hour, although efforts in Congress to do that fizzled this summer. And with Republicans, who generally oppose raising the minimum wage, winning control of the Senate and expanding their House majority yesterday, it’s unlikely that any new effort in Congress will get very far. After analyzing public-use microdata for 2013 from the Current Population Survey (the same monthly survey that underpins the BLS’s wage and employment reports), we estimate that last year about 20.6 million people — 30% of all hourly, non-self-employed workers 18 and older — are in that “near-minimum-wage” category. That includes 8.8 million people in states with minimums above $7.25, and 11.8 million in states where the federal rate applies. This broader group of low-wage workers looks much like the approximately 3.3 million hourly workers who earned the federal minimum or less last year. (The $7.25 rate doesn’t apply to tipped workers and a few other categories.) Altogether, nearly 24 million workers would potentially benefit from a minimum-wage increase to $10.10. The near-minimum are young (just under half are 30 years of age or younger), mostly white (76%, a bit below whites’ 79.2% share of all wage and salary workers), and more likely to be female (54%) than male (46%). Most have low educational levels: 56% have no more than a high-school education, while another 37% have some college but less than a bachelor’s degree. Hispanics, who make up 16.4% of all wage and salary workers, comprise more than a quarter (26.7%) of the near-minimum group. 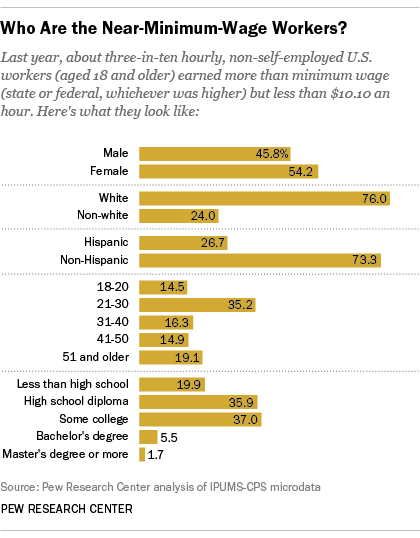 Different demographic subgroups are more or less likely to fall into this low-wage group. For example, 46% of female Hispanic hourly workers were near-minimum in 2013, but only 25% of male hourly workers who are white were. Two-thirds (67%) of employed women with less than a high-school diploma were near-minimum, versus just 10% of women workers with master’s degrees or higher educational credentials. Looking at the U.S. by the Census’s regional divisions, near-minimum workers generally were more common in the South than elsewhere. More than a third (36.7%) of wage and salary workers in the West South Central division (Arkansas, Louisiana, Oklahoma and Texas) and 36.2% in the East South Central division (Alabama, Kentucky, Mississippi and Tennessee) earned near-minimum pay, as did 31% of workers in the South Atlantic division (which stretches from Delaware to Florida). They were least common in New England, where less than a quarter (23.4%) of workers earned near-minimum pay. Steve Schwarzer is a research methodologist at Pew Research Center.